Get ready to be the hottest mom or dad on the block. Acura seems to have a difficult time making its mind up on what it wants the RDX to be. The first-generation model back in 2006 was one of the original pioneers of turbocharging in the compact crossover segment with a 2.3-liter i-VTEC unit, making it the first Acura/Honda product in the US to go turbo. Then in the second-generation RDX, Acura decided to ditch the turbocharged engine in favor of a more conventional 3.5-liter V6. 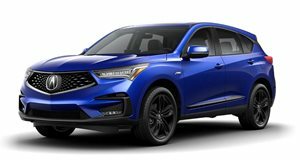 Now, the third-generation RDX returns with a 2.0-liter turbocharged engine producing 272 horsepower and 280 lb-ft of torque through a 10-speed automatic transmission. This is the same engine found in the Honda Civic Type R as well as the Accord, meaning it can be tuned to produce even more power. If you've just bought an Acura RDX and want more power, aftermarket tuner Hondata has you covered. Hondata has already worked its magic on this engine in the Civic Type R and even brought the Accord up to Type R levels of power. For the RDX, Hondata will offer two stages of tune with different levels of output. Stage 1 operates in all four of the RDX's drive modes and adds 10 hp across the rev range. Peak power only increases by a modest five hp and torque increases by 10-15 lb-ft. Hondata says its dyno figures aren't as high as they were in the Accord because of the RDX's all-wheel-drive drivetrain loss. Stage 2 is tuned to produce Stage 1 levels of power and torque in the snow and comfort modes. In the sport and sport+ modes, the Stage 2 tune produces 28 more mid-range hp and 36 more lb-ft of torque for totals of 300 hp and 316 lb-ft of torque. If you can't wait for Acura to reveal its upcoming Type S models with a new twin-turbo V6, this Hondata software seems like a great alternative. You can now order Hondata's FlashPro computer for $695, though it is worth noting neither tune is CARB legal in California. The Acura RDX is the automaker’s first compact luxury crossover SUV and on paper it’s an attractive offering.